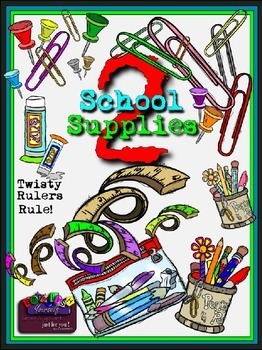 This is a set of school supplies you can use in combination with my original clipart set “School Supplies 1” to get your back to school projects completed! They can be used all year long, for many age groups and for a variety of projects! Bold in color with my unique line style, these fun graphics are sure to please! They are drawn freehand and all 37 graphics are shown in the preview for your convenience. These, combined with any of my other school clipart sets (click the green links below to view) will help you create projects that have outstanding character and will definitely create memories for your students! You can also mix and match graphics from my “Strings, Banners, Flags & Pennants” "Double Buntings"
“Fun Shapes” and "Numbers 0-9 with Patches & Polka Dots" for exceptional results! Included are 7 main black outlines with white fill, 2 different styles of glue sticks, a pencil bag, a pencil & pen holder in bold and pastel colors, 11 colorful paperclips, 8 push pins, and 6 twisty rulers in various colors. 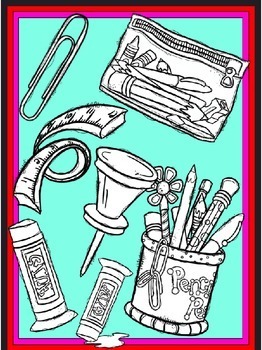 Create many cool, memorable back to school projects with the following sets. Just click the green link to check them out!